Making unbaked biscuits for the freezer helps you get a jump on busy-day meals. 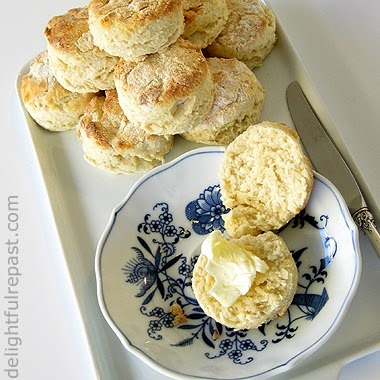 I love being able to pull out as many biscuits as I need and maybe even a main dish or a side--a casserole from a day when I really had my wits about me and made a big batch of something, enough for a meal that day and one later. The freezer can be your best friend! Freezing unbaked biscuits is something you can do when you have a few extra minutes on your hands, or you can just freeze a few every time you make a batch of biscuits and need fewer than twelve. You'll feel so clever! And, unless you're Southern (I'm half Southern, on my Daddy's side), you may not know that biscuits aren't just for breakfast. They go with lunch and dinner as well. There could be a feast on the table, but if there wasn't some sort of bread, Daddy's dinner was not ready! 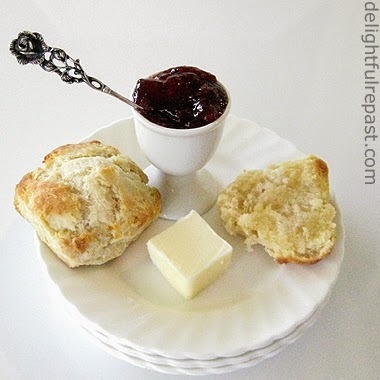 Here are my two basic biscuit recipes, one made with a combination of organic milk and buttermilk, sour cream or plain yogurt, and one with organic buttermilk powder and milk. I always use organic flour and butter as well. There's nothing like hot, homemade, fresh-from-the-oven biscuits to round out any meal! Especially when topped with homemade jam, like my Strawberry Freezer Jam or Peach Freezer Jam. 1 Lightly spray a baking sheet with cooking spray or line it with parchment paper. In a 2- to 3-quart bowl, whisk together the flour, buttermilk powder (if using), baking powder and salt. With your fingers (or a pastry blender or two knives, but fingers are best), cut in the cold butter until the mixture looks like coarse crumbs with some bigger uneven chunks remaining. 2 In 1-cup glass measure, measure milk (for recipe with buttermilk powder) or stir together milk and buttermilk, sour cream or plain yogurt. Pour 3/4 cup of the liquid over flour mixture and gently mix until just combined, adding only as much of the rest as needed. 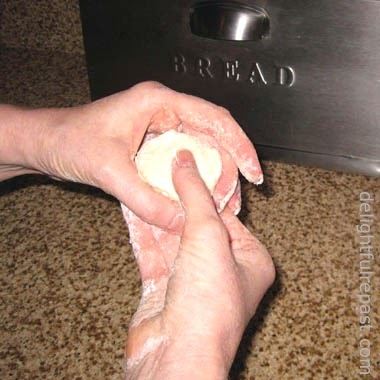 Squeeze the dough gently together and place it on a lightly floured surface. Note: Especially if making the recipe with just milk, start with just 3/4 cup, adding more only if the mixture still has dry spots. 4 Place the biscuits on the prepared baking sheet, cover lightly with plastic wrap (I use a half-sheet pan with storage lid), place in freezer. Once the biscuits are completely frozen (about three hours), put them in a freezer bag or container and store in freezer for up to 2 months. 5 Preheat oven to 475F/245C/Gas9. Take out desired number of biscuits and place 2 inches apart on appropriate size baking sheet (I like to use an insulated baking sheet for biscuits) that has been lightly sprayed with cooking spray or lined with parchment paper. Brush tops with milk, buttermilk, cream or melted butter, if you like. Bake for 5 minutes at 475F/245C/Gas9; lower temperature to 425F/220C/Gas7, and continue baking for 10 minutes or until golden brown. Peach Pie for Two (or One or Four) is the perfect little summer pie for one or two people who don't want to have leftover pie hanging around for days. (Who are those people?!) I don't mind having to eat lots of pie day after day, so only make the little pie for one of two reasons: 1. to look cute on the tea table or 2. because I don't have enough peaches to make a regular 9-inch pie. For my half-size, four-serving peach pie for two, I have always used the Pyrex 207 Petite Pie Plate with scalloped handles. I've had two of these for ages, since I was very young; but I didn't realize just how long I've had them until I looked them up on Amazon so you could get a couple, too. It seems these handy little 7-inch clear glass pie plates are now "vintage." Even though I've gotten along just fine all these years with just two, now that I know they were discontinued shortly after I bought them, I'll be hitting every thrift store in the vicinity, desperate for more! The closest I could find for you is this Anchor Hocking 6-inch glass pie plate. And this Fox Run 7-inch pie tin. Here's the 7-inch pie set on an 8-inch glass pedestal for the tea table. I cut this size pie into 8 or 12 pieces for afternoon tea: 8, if it is to be eaten with a fork; 12, if it is a pie that can be eaten without a fork. * If you're gluten-free, here's my Gluten-Free Pastry for 9-Inch Pie Shell. 1 Preheat oven to 425 degrees. Roll out half (the larger "half," if they're not exactly the same) to an 11-inch circle and fit into 7-inch pie plate. Crimp edge now if you're going to use cutouts for top; otherwise, leave uncrimped for now. 2 Place in freezer. Roll out other half of pastry to either use as regular top crust or to cut into strips for lattice crust or cut out shapes with a cookie cutter (I used hearts today). Place it on a baking sheet and pop into the freezer or refrigerator for a few minutes while you make filling. 4 Add sugar mixture to peaches and mix gently but well. Pour into pie shell. 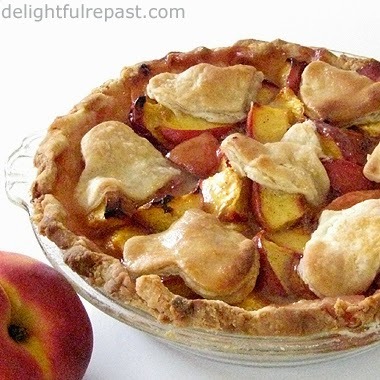 Fit top crust or lattice, or arrange pastry cutouts atop peaches. 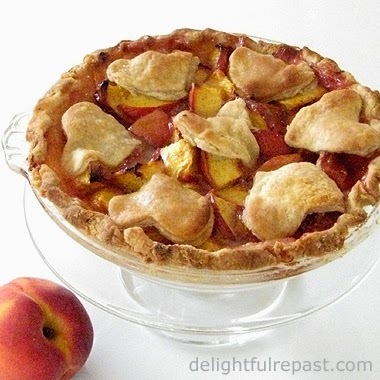 Note: You'll find directions for lattice crust on my Peach Pie with Lattice Crust post. 5 Place a foil-lined rimmed baking sheet in the middle of the oven to catch any drips, and place the pie on the baking sheet. Bake at 425 degrees for 25 minutes. Lower temperature to 350, and bake for an additional 30 minutes (juices should be bubbling). Cool on wire rack for at least 2 hours before serving. Everybody needs a basic yellow cake recipe. And if it just happens to be an easy one-bowl cake, so much the better. In my recipe the inimitable flavor of butter comes through loud and clear, accented with vanilla extract. I love the texture of this cake. Despite what you may have heard, you don't need to used bleached cake flour to make a tender cake. I use organic unbleached flour for all my baking (except the gluten-free baking, of course). This one is frosted with chocolate, but I really love it with the Caramel Flour Frosting I posted last week. 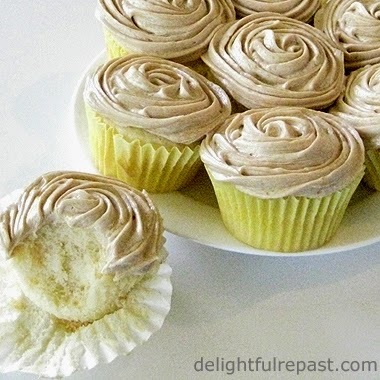 You'll find my gluten-free version under Velvety Vanilla Cupcakes - That Just Happen to Be Gluten-Free. 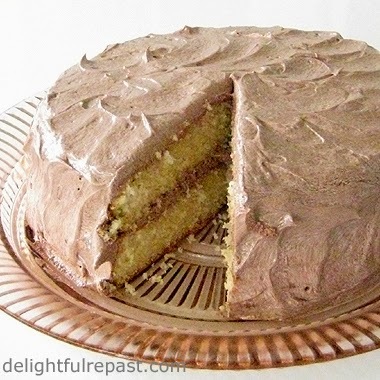 What is your favorite cake flavor / frosting flavor combination? 1 Preheat oven to 350F/180C/Gas4. Grease well and lightly flour two 8-inch layer pans. 2 In large mixing bowl (I use a Cuisinart stand mixer), combine flour, sugar, baking powder and salt; and mix on low speed for one minute to blend. Add the softened butter and 3/4 cup of the milk. Mix on low speed until the dry ingredients are moistened. With mixer on medium-high speed, beat for 1 1/2 minutes. Scrape down the sides. 3 Add the eggs, vanilla extract and 1/4 cup milk. With mixer on low speed, beat for 30 seconds to combine. Scrape down the sides. Increase speed to medium-high and beat for 1 minute. Scrape down the sides. 4 Pour into prepared pans. Bake for 30 to 35 minutes. 5 Cool in pans on wire racks for 10 minutes. Remove from pans and cool on racks for at least an hour, until completely cool, before frosting. You might think Old-Fashioned Flour Frosting is just for those times when you don't have powdered sugar on hand for the usual American buttercream frosting, as was sometimes the case for my Southern grandma who lived through the Great Depression (which, I'm told, is when this kind of frosting was invented). But I like this frosting ever so much more than American buttercream, and it is just as easy. No eggs, no temperature monitoring, no complications. And no raw cornstarchy powdered sugar taste. The texture is amazing, soft enough to spread on the cake and firm enough for piping. Best of all, it uses less than half the sugar of the typical American buttercream and, though plenty sweet, is not cloyingly so. There are different methods to make this type of frosting, but I've only ever made it this way and have found no reason to try others. Some people just cook the flour, salt and milk and then cream the sugar with the butter. I can't imagine how long I'd have to beat that to get the grittiness of the sugar out of it. Why not just cook the sugar with the flour and avoid any possibility of grittiness? I was in the mood for caramel cake--yellow cake with caramel icing--and decided to make it as cupcakes. Instead of my traditional caramel icing, I thought I'd try to come up with a caramel version of old-fashioned flour frosting. Instead of using granulated sugar, I used an equal measure of dark brown sugar. What are your favorite cupcake and frosting flavors? 1 In heavy-bottomed 2-quart saucepan, whisk together dark brown sugar, flour and salt. Gradually whisk in milk until mixture is smooth. Cook over medium heat, whisking constantly, until mixture bubbles and thickens; it should be very, very thick. Remove from heat; leave the whisk in it and give it a stir from time to time (helps it cool and prevents a skin from forming) and let cool to room temperature. Stir in vanilla. 2 In stand mixer fitted with the flat paddle, cream the butter until light and fluffy. Add the cooled flour mixture (I have always added it in three additions, but I don't know if that's really necessary) and beat on medium-high until it all combines and resembles whipped cream. With my Cuisinart stand mixer, that's speed 7 for 7 minutes, pausing halfway through to scrape down the sides of the bowl. 3 If you're going to be piping a border or anything, put a little of the frosting into a piping bag and refrigerate the bag while you're frosting the cake. For these cupcakes, I didn't even chill the frosting at all, just used it straight from the mixer. 4 Refrigerate cupcakes until about an hour before serving time. Refrigerate a cake until three hours before serving time; it should stand at room temperature for about three hours before slicing and serving.